I don’t run. I brisk walk. Brisk walking is one great exercise. It makes you healthy. But brisk walking outdoors in a place called Metro Manila would actually make you more sick than healthy. The air is so polluted it would be stupid to jog or brisk walk outside. And if tough luck besets upon you droplets of acid rain may even infiltrate your lungs making you even more prone to illness. That is why a Metro Manila inhabitant like me would rather settle to go to a gym and do my brisk walking on a painfully boring treadmill. Let me be clear that I do not detest Metro Manila the way I have grown to detest the treadmill with growing hatred. 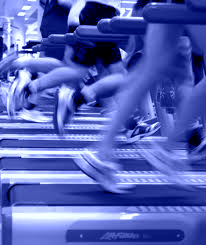 Brisk walking on the treadmill is a mental game for me. Aside from shaping up my delicious mortal chassis, brisk walking on a treadmill for me is an exercise of mental toughness. It is because brisk walking on a treadmill is so god awfully boring. There’s nothing more dreadful than seeing the seconds count down and being fully aware of how much time is still left and the calories you have shred off was actually just equivalent to a spoon of mayonnaise. To ease the agony of boredom and win the battle against this mentally tormenting machine, I have sought the service and assistance of musical artists particularly of the dance-electronic genre. Now I shape up and step on a treadmill with matching beats. My walk has gone interesting since the pacing and distance of each stride depends on the beats of the music on my earphones. Music of Alexis Jordan has been an often tune in my playlist every time I step on the treadmill. She’s got great selection of songs with varying fast beats. The most recent one that I truly enjoy listening to is ironically entitled Acid Rain. This is the Acid Rain that will definitely not hurt at all. Now, boost up the volume and start listening!